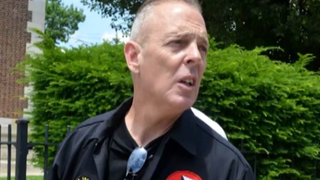 William Walters, grand dragon of the East Coast Knights of the True Invisible Empire, aka the Ku Klux Klan, got the boot from his five-year post on a neighborhood watch in Philadelphia earlier this year after city officials learned that he was passing out KKK recruitment literature while on the job, reports Philadelphia magazine. Apparently, no one knew that Walter was heading the hate group until the fliers popped up. Walter has been a KKK member for 30 years and has lived in the neighborhood for the last 20. He also served as Republican committeeman in Philly’s 65th Ward for more than a decade until his recent ouster. Walters also went on Fox News radio host Alan Colmes’ show this week to explain his perspective, Raw Story reports. There he described the East Coast Knights of the True Invisible Empire as a “white Christian organization.” Colmes chimed in to remind him that it was unlikely that Jesus was white and that he was most likely an olive-skinned person of Mediterranean descent. Colmes asked Walter why his group limits its membership to white Christians, and Walter responded that the NAACP is an exclusive organization. The radio host then reminded him that white people are able to join. Walter countered, “We’re just showing interest in our race. Why? Because we want to promote the heritage of our white race. We want to keep it that way,” reports Raw Story. He went on to explain that the group promotes Christian tenets but is against homosexuality and interracial relationships. Regardless, Walters insisted on the show that he has a number of black friends and has treated his black neighbors fairly during his time with the neighborhood watch. Colmes in turn asked if Walters was aware that white people and black people are part of the same human species, pointing out that President Obama is mixed race. Walters agreed that they are but countered that the KKK promotes racial purity so children won’t get confused about their heritage: “There should be a difference between black and black and white and white. A child gets raised up, he gets teased in school, he doesn’t know what to be proud of—black or white. Everybody should be proud of their heritage,” he said. “We’re trying to promote white race and the heritage, just like the blacks,” he added, according to Raw Story. Last weekend a few of Walter’s KKK members protested the neighborhood watch’s decision to remove him by standing in front of the Tacony branch of the Free Library, Philadelphia magazine reports. Walters joined them wearing his KKK uniform. The group attracted the attention of a larger group, who laughed and yelled at them until the KKK members left. The KKK is planning to return there for another rally in the fall. Walters plans to seek legal action against the town watch and the 65th Ward but hasn’t found a lawyer to accept his case, notes Philadelphia magazine. He sent a letter to the American Civil Liberties Union but was denied, and now he’s awaiting a response from the Philadelphia Bar Association. Read more at Philadelphia magazine and Raw Story.